Short Hairstyles | emma etc. I've had shorter hair for a while now and I've had enough time to experiment with other hairstyles to see what works best for me. Day to day I really don't make much effort with my hair - I will just straighten it and leave it like that. Sometimes I will tie the top half of it back and put the shorter bits I now have to the front. 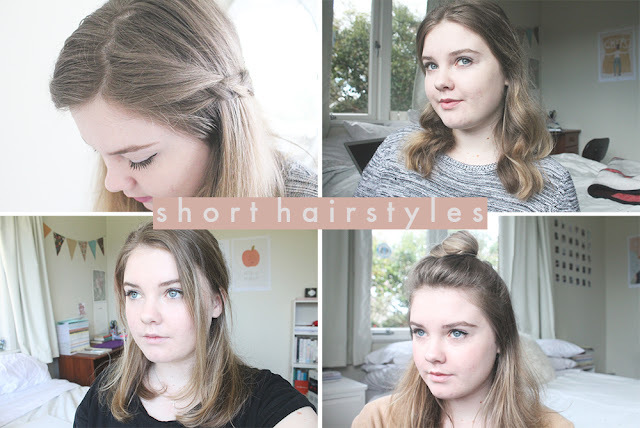 If you're looking for some short hair inspiration (or just any length to be honest) here are some casual hairstyles you could try! Plaits: I think having little plaits in your hair is really cute, so if I want to do this I would simply plait the front bits of my hair (I think a side prating looks best with this one) and pin them back with bobby pins. I think this is quite good on 'dirty' hair too because your hair has a bit more grit. Curled: As you can see in the photo, I like my curls to be quite loose and wavy. I think curls can instantly make your hair look just the extra bit nicer. I don't curl my hair that much, but it's nice for a change. I would tie the front bits of my hair back or just have it all out for a casual and easy look. With shorter hair, curling my hair doesn't take long at all so it's actually quicker than you'd think. Half down/Half up: This is probably my favourite hairstyle with my shorter hair because I just think it looks the best and it literally takes 30 seconds. I would just make a centre parting, tie the front half of my hair back with a hair-tie and then take the shorter bits out across my face so it's a little more flattering. If my hair needs to be washed but I don't have time/don't want to then to hide the oily parting I would alternatively bring all of my hair forward (top half) and tie it into a high half ponytail on my head. Half down bun: I'm sure you've all seen this hairstyle - it's pretty popular at the moment. I'll only do this hair every now and then if I feel like it but it's basically a bun on top of your head with the other half of your hair down. With shorter hair I definitely don't like tying it up now so it's nice to have half of your hair down. To do the bun I just twist it around, secure it with a hair-tie and then use any bobby pins and hairspray to make it stay in place. When I do this hairstyle I will usually wash it straight after so my hair doesn't look cray after taking it out. What are some hairstyles you like to do, short or longer hair?